The need to restructure our economy has left some senior workers facing anxiety towards job security. 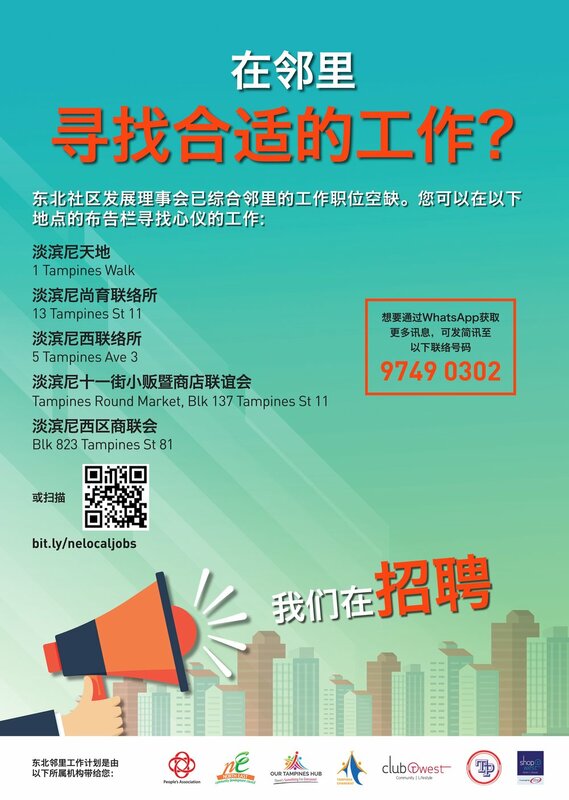 With job assistance as one of our core focuses, North East Community Development Council (CDC) is working together with Our Tampines Hub, Tampines St 11 Hawkers & Merchants Association and Tampines West Merchant’s Association, to pilot the “Local Jobs” initiative. The Local Jobs initiative is a convenient, one-stop platform that allows jobseekers to view all the available job opportunities that are located around Tampines. Currently, there are 24 employers onboard, offering over 120 job openings at print time. If you, or someone you know, would benefit from this, please visit the link for more information: http://bit.ly/NE_LocalJobs. To receive first-hand updates of job opportunities, join our WhatsApp Broadcast Group now by subscribing to 9749 0302. Feb 22 Are You From The Merdeka Generation?